When you don't like what the State is doing, then opt out of what the State wants you to do. For more, read this discussion and this excellent post on how money power corrupts politics. This a great cartoon! I don't think the links quite match though. 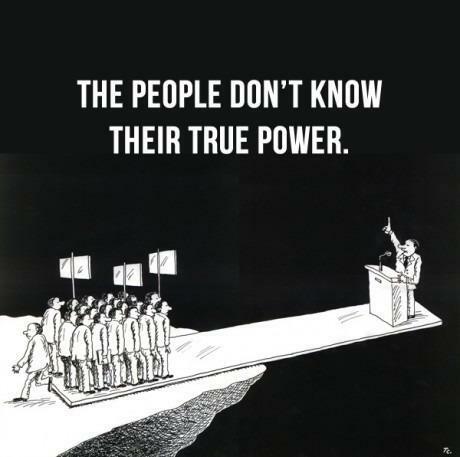 The cartoon implies that power is relational and the consent of the majority is what maintains it. The links talk about power vs. money as the driving force in a political monolith. Sure the system is complex and very difficult to change, it would be shocking if it wasn't. All sorts of political actions can be viewed as corrupt, but I think the essential point, that isn't addressed in the links, is that we can collectively walk away and/or sidestep the entire process by organizing and strategically solving our own problems. Do we rail against the political system and try to reform, or maybe just complain about, it? Or do we stop caring that it's so corrupt and start striving towards meeting people's and the planet's needs, sometimes within and sometimes outside of "the system"?